Smoky and autumnal with just a whiff of anise, this is delicious with ham, pork, duck or pheasant. Don’t use any more star anise than suggested or it will taste medicinal. It might seem a hassle to cook the fruit twice, but it really does help extract more juice. 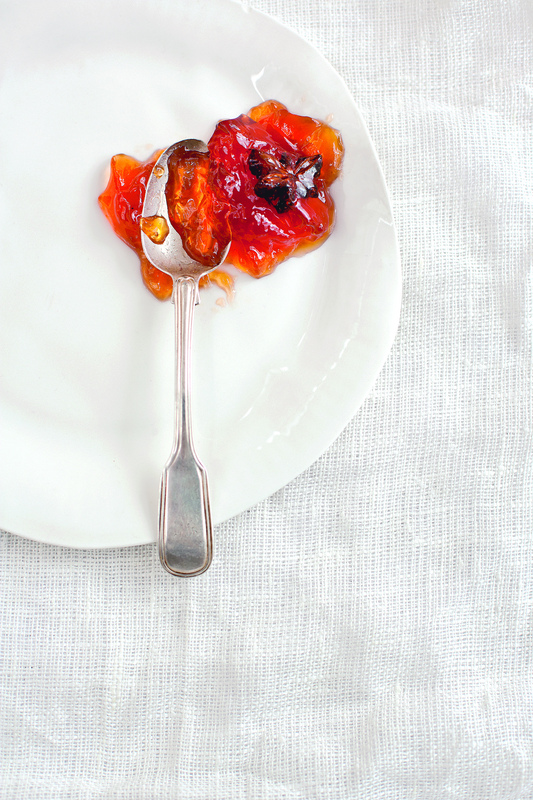 The jelly is a wonderful glowing russet colour. well over the top, if you are using a preserving pan, as they don’t come with lids). drain overnight. Keep the resulting liquid and put it in the refrigerator. or until setting point is reached (check on a sugar thermometer and do the wrinkle test, see page 11). Skim off any scum and lift out the muslin bag of star anise. pot, but it is more for decoration than flavour. Seal. This keeps for a year; refrigerate once opened.